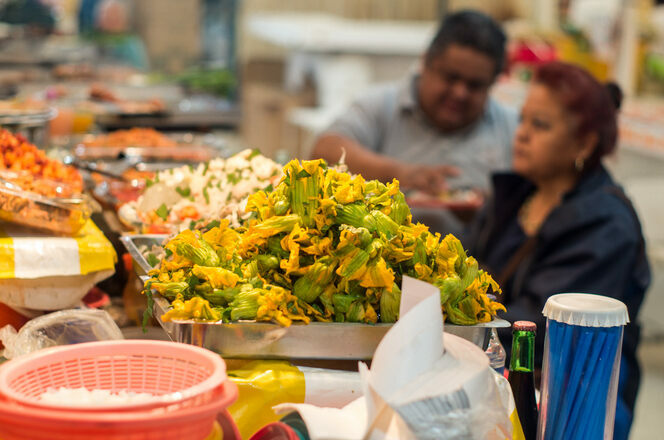 On this culinary adventure, immerse yourself in the complex cultural identity of Mexico City, where pre-Hispanic, colonial, and contemporary influences collide. We’ll explore mouthwatering local gastronomy, celebrating the harmony as well as the dissonance that define this layered city, which thrums with the activity of a large population of regional migrants and modern transplants alike. Together, we’ll experience moments when the city’s numerous identities are expressed and aligned perfectly—for instance, enjoying a street snack of tacos al pastor while taking in a hidden Diego Rivera mural. But we’ll also be looking for the fractures, zooming in on specific influences: a heady Aztec brew, or a colonial-era mole recipe, or the unique, pre-Hispanic floating farms still in use today. We’ll be sure to also head out of the center city in an attempt to isolate and better understand these culinary traditions with a visit to the floating boats and green oasis of Xochimilco.From street food to contemporary Mexican dining trends, traditional restaurants to meals in local homes, our focus throughout the trip will be food and the people who make it. On the periphery of our taste buds will be the history, art, architecture, landscape, agriculture, and street life that brings everything together. Arrive in Mexico City and check into our group’s hotel. We encourage you to plan your arrival earlier in the day to give yourself some time to relax, settle in, and wander around the neighborhood. This evening, we’ll enjoy a lively welcome dinner at Limosneros, where chefs Marcos Fulcheri and Carlo Méndez will work with pre-Hispanic ingredients, colonial techniques, and modern creative twists to create an unforgettable meal. In a private room, we’ll share our first of many meals and conversations together. Paco, your main culinary guide, will introduce himself and give you a glimpse into what the week will hold. After breakfast at our hotel, we’ll be spending the day in downtown’s Centro Histórico for a crash course in the history of Mexico City, with visits to the “obscure side” of major monuments and to sites that are hidden from view. We’ll visit Templo Mayor, a pyramid built in the 1400s and the former site of human sacrifices, and explore the colonial city, built over the ruins of the Aztec city of Tenochtitlan using the same lava-stones from the Aztec temples. 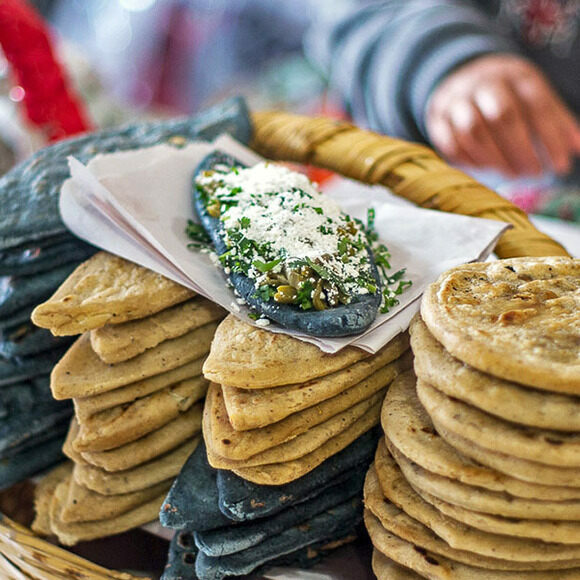 For lunch, we’ll be dropping by a family-run Oaxacan grocery/restaurant in the heart of one of the city’s oldest commercial districts, Barrio de la Merced. Once home to large communities of newly arrived Jewish and Lebanese merchants. The afternoon will include other highlights, such as visits to the Diego Rivera murals, Bellas Artes Palace, and Zócalo Main Square. Paco will be sure to bring us to any special events or exhibitions taking place at the time of our visit! Come evening, we’ll set out on a taco tour, hitting a number of nighttime taco stands, including an al pastor spot housed in an auto repair shop. Along with classic tacos, we’ll also have the chance to taste ones made with brains, bull’s eyes, and intestines. Afterwards, head back to the hotel for some well-earned rest, or explore some of the local nightlife on your own. Today, we’ll delve deep on the subject of all things mole, learning about ingredients, production techniques, regional varieties, and how this food represents the colonial heritage of Mexico. 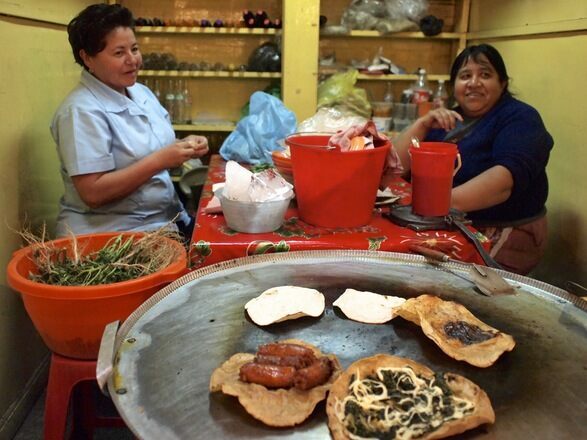 First, we’ll head to Milpa Alta, a center of mole production on the outskirts of Mexico City. 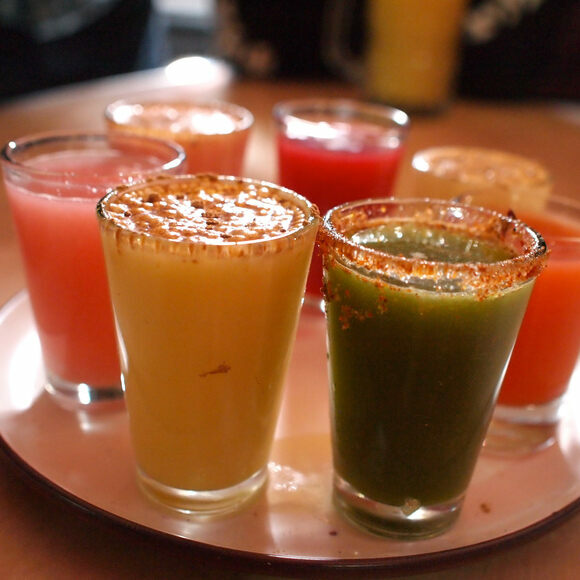 On our way, we’ll stop by the home of a local villager to learn about the artisanal production of pulque, a pre-Hispanic drink made from the sap of the agave-like maguey plant. In the afternoon, we'll visit private homes and markets to gain a better sense of daily life and the food that shapes and defines it, finishing our visit with a late lunch starring—what else?—mole. Back at our hotel this evening, take some time to rest and relax from the long day, and have dinner on your own or with some of your fellow travelers. Xochimilco, a green oasis on the southern edge of the city, is a highlight of the region and treasure of Aztec-era living culture. 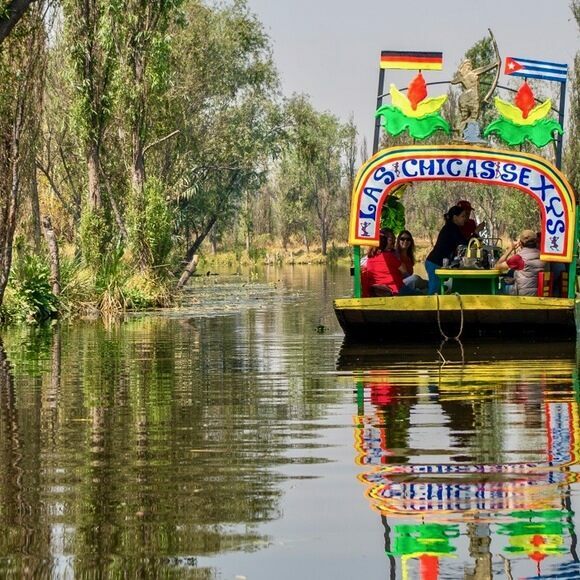 Unlike many pre-Hispanic-era monuments that are entombed in museums, Xochimilco is a living place with working farms and much to see, eat, and drink, all linked to pre-Hispanic Mexico. After heading out from our hotel after breakfast, we’ll enjoy lunch aboard a traditional flat-bottomed boat as we float along Aztec-era canals. These waterways have been in use for more than 2,000 years and are now a UNESCO World Heritage site. Our meal will be prepared by locals using products from the chinampas, the area’s famous “floating farms,” one of which we'll have the chance to visit. 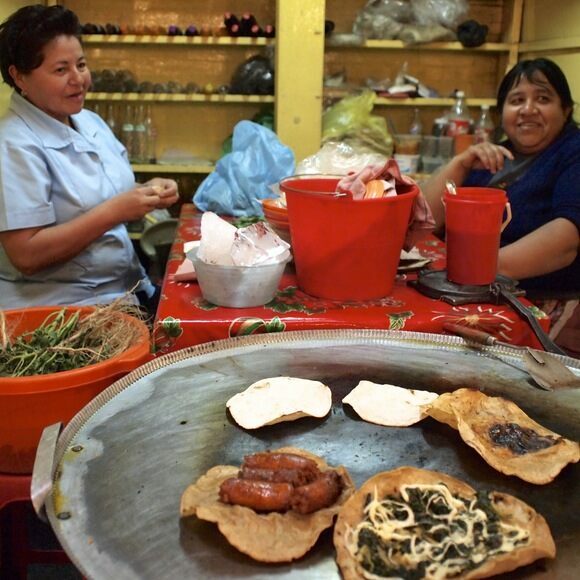 Back on land, we’ll check out a local market and get a taste of pre-Hispanic Mexico via tlacoyos, a fried masa cake, and tacos made with meat slow-cooked inside the leaves of the maguey plant. We’ll also visit the area’s enchanting Dolores Olmedo Museum, located in a rambling16th-century hacienda and home to an important collection of works by Diego Rivera and other Mexican masters. This evening back in the city, we’ll attend a Lucha Libre wrestling match followed by a visit to Mexico City’s vibrant "mariachi square" for live music, dancing and one more festive meal together! Today, depart for home or onto your next destination—or, if you'd like, spend a few more days exploring Mexico City. Our guide will be happy to provide additional recommendations. Until the next adventure! For flights in and out of Mexico City International Airport (Aeropuerto Internacional Benito Juárez), we suggest you arrive by 3 p.m. on April 2 and depart anytime in the morning on April 7. We are happy to book you extra nights at the group's hotel and provide suggestions for things to do and see in the city on your own. Five nights of hotel accommodation.